Calgary Tower is an iconic part of the city of Calgary’s skyscape. Built in 1968 at a cost of $3.5 million it was designed and constructed to celebrate Canada’s centennial of 1967 and as part of an urban renewal plan. Originally called the Husky Tower, it was design by W. G. Milne and is built from concrete and steel. One stand out feature in the towers construction was the new continual pour of concrete technique used. Concrete pouring for the tower commenced on May 15, 1967 and finished a full 24 days later. Calgary Tower has the highest 360° observation deck in the world and stands an impressive 1228 metres above sea level. In 2002 the tower was completely renovated on all levels. Improving facilitates, adding a new lobby area and gift shop. As you enter the tower at first you come across the Tourism Calgary Information Centre. This centre provides visitors with all the latest information about events and attractions in the whole of Calgary. It’s a nice place to visit early in your trip to Calgary to get the low down on what happening this week. To go up the tower we had to pay around $15 (2012) plus tax, per person – which was a little more than I expected at the time. However it’s an experience that will live long in the memory. 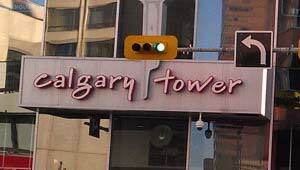 One of the highlights of our trip to the Calgary Tower for me was the lift ride up to the top. We clocked it a 1 minute 30 seconds from base of the tower to the observation deck – when you’re in the lift it seems like a extremely long time. Once you arrive on the observation deck the views a staggering. There’s a full 360° viewing platform which you can see the whole of down town Calgary as well as the start of the prairies and Rocky Mountains. A nice feature of the Observation Deck is the glass floor opposite the lifts. When standing on the glass floor you get a real feeling for just how high you are. The Deck spans out over 9th Avenue SW and Centre Street North so you can see cars and people go by right under your feet. Dotted around the Observation Deck are some long-range standing binoculars that enable you to see far off details close up. We stayed up the tower for around an hour before heading down. In the tower are two restaurants, Ruth’s Chris Steakhouse and the SKY 360 Restaurant. Calgary Tower offers a unique viewing experience of the City of Calgary as an iconic feature of the skyscape is a must during your stay.